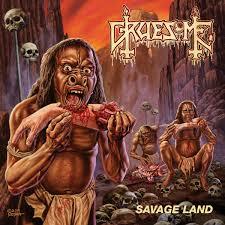 Gruesome – Savage Land – Relapse Records – Release: Out Now. I remember when I first saw the awesome album cover and was taken back to the old school death metal. None other than the legendary Ed Repka created this to fit perfectly with Gruesome’s offering; unashamed Death worshipping, focussing on the classic “Leprosy”! It really is basically a remix of old Death songs and instead of the modern day crisp production the band chose to use a slightly more old school sound, completely taking you back to the old times of Death. Now, people are generally in either of two camps with this album. Either they love the worshipping and remixing of old songs or they dislike it and rather put on the authentic product. Either way makes this album a success. I for long fit in the former camp! ©2010 - 2018 - Livereviewer. All Right Reserved.